What are the Benefits of Double Hung Windows? Even if you don’t consider yourself a high tech person, learning a little about new patio door technology can help you choose the sliding patio door that will most benefit you and your home. When you are shopping for patio doors, consider zinc-coated twin-tandem, bottom-mounted rollers on an advanced monorail system. This ensures effortless gliding and tight closure which guarantee your patio doors many years of quiet, smooth operation. Why the zinc-coating? Zinc is a natural enemy of rust and affords a protective barrier against the elements. This increases the average lifespan of materials to up to 30 years. With crime at an ultimate high, there is no such thing as too much caution when it comes to your home’s security. It is important to ensure that top-of-the-line security locks are in place on your sliding patio doors. A 2-way, keyless lock offers you the convenience to lock and unlock your sliding patio doors either from the inside or outside. And, instead of a key that can be lost or misplaced, features a keypad on which you can program a code in order to enter. For some high-tech locking systems, there are also wireless capabilities. The benefit of this type of lock is that it has increased security because they are left unlocked less often and are stronger and more tamper-resistant than typical locks. Keep in mind that there are sometimes huge differences in the quality of one manufacturer’s vinyl to another. This is due to the fact that vinyl begins as raw materials that are mixed by compounding. Different formulas determine the performance of the vinyl over time. Each addition to a manufacturer’s vinyl “recipe” will dictate its long-term performance, including insulation, color retention, strength, impact resistance and weather-resistant properties. The addition of titanium dioxide, for example, makes vinyl highly resistant to heat. Be sure to inquire about the specific properties of the vinyl you are considering because you want to get the grade of vinyl that has been designed exactly for your climate and purposes. When you choose advanced glass technology, it improves the thermal performance of your sliding patio doors, blocks ultraviolet light and improves glass strength. Different air-seal gases are available to improve heat reduction or retention, and even easy-clean technologies that utilize sunshine and rain to enable windows to shed dirt and water. With all the sliding patio door technology available, it’s an amazing time to be a homeowner in Ontario. Take advantage of the opportunity to install sliding patio doors in Brampton that you can not only be proud of but that maximize your home’s performance and security. 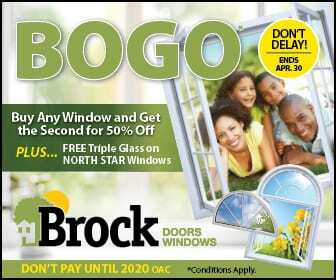 Brock Doors and Windows have been offering the latest in patio door technology for over 25 years, and when you choose Brock, you are choosing exceptional performance, long-lasting energy efficiency, and unsurpassed security for your Brampton home.